Just a 10-minute tram ride from the Semperoper Opera House, this hotel is peacefully located in Dresden. It offers modern rooms with free Wi-Fi internet access. The Mezzaluna hotel is set back from the road in the second row of houses. It has spacious rooms which are separated from the hallway by at least 2 doors. The breakfast buffet is served in the Mezzaluna's breakfast room on the ground floor. Dresden's New Town, with its many restaurants, bars and shops, is just a 10-minute walk away from the Mezzaluna. The Tannenstraße tram stop is just a 5-minute walk away. From here, the tram lines 8 and 9 go directly into the Old Town in 10 minutes. This friendly hotel is situated in the quiet Briesnitz residential suburb just to the west of Dresden, just a few minutes’ drive from Dresden city centre and the A4 motorway. The Hotel am Nussbaum is just a 10-minute drive from Dresden’s exhibition centre, and a 20-minute drive from all main world-heritage attractions in the city centre, such as the Semper Opera, Church of Our Lady (Frauenkirche), Royal Palace or the Zwinger Palace. Be sure to try one of the many delicious Saxon specialities on offer in the hotel restaurant. The hotel is located very close to the River Elbe Cycling Path (Elbradweg) which offers the chance to explore the beautiful Lößnitz countryside on 2 wheels. Bike storage space is available on site. Many of the rooms offer a beautiful view, either of the Lößnitz mountains, or the unique cityscape of Dresden. - Take the Dresden/Hellerau motorway exit towards the centre of Dresden centre. - Turn left at the 2nd set of traffic lights towards Radeberg/ Pillnitz/Bergbahn. - Continue straight ahead on the B6 (Bautzner Straße) towards Bischofswerda/Pillnitz/Bergbahn. - At the traffic lights, drive uphill and head for the forest towards Bischofswerda/Bergbahn (not Pillnitz). - After the traffic lights (about 200 metres before the turning), turn right into Rißweg. - Turn left at the 2nd junction and then left into Oskar-Pletsch-Straße. - At the next corner (after about 175 metres), turn right and you will find the hotel. At the airport, take the train to Dresden Neustadt and then take train number 11 towards Bühlau until the Plattleite stop. Then continue walking and turn right at the next junction into Luboldtstraße. Continue and turn left at the second junction into Stangestraße (becomes Oskar-Pletsch-Straße). Go straight ahead until you reach the hotel (400 metres away). - From Dresden's main railway station take tram number 3 towards "Wilder Mann"
- Get out at the stop "Synagoge"
This hotel enjoys an easily accessible yet peaceful location just a short drive from the airport, the main railway station and the Old Town. Free Wi-Fi and on-site parking is included. A`ppart Hotel Garden Cottag offers attractive guestrooms with all modern comforts in addition to fine regional cuisine. Take advantage of the convenient location to explore Dresden’s beautiful historical centre, which can be reached in just 10 minutes. Business guests and trade fair visitors will appreciate the accommodation's proximity to the exhibition centre, as well as the fully equipped conference rooms. The décor of the rooms at the Hotel Windsor has been inspired by English country clubs. At the Hotel Windsor, a varied breakfast buffet is available each morning for an extra charge. A range of restaurants can be found near to the hotel. The centre of Dresden can be reached in less than 25 minutes by public transport. The Dresden Alttrachau tram stop is just a 2-minute walk away. Situated just a 4-minute walk from the banks of the Elbe, this guesthouse offers comfortable and affordable guest rooms in one of Dresden's most attractive districts. Bus and tram stops can be reached in just one minute, and from there public transport services take you to the city centre in just 30 minutes. A short ferry ride brings you to Pillnitz, the summer residence of "Augustus the Strong", which lies within a wonderful landscaped garden. We can provide 2 separate event rooms, perfect for family celebrations, company functions and reunions. This hotel building was constructed in the 11th century and is the oldest documented building in Dresden. Despite being lovingly restored, the building still maintains its historical charm. Free Wi-Fi and Czech specialities are offered by this hotel in Dresden. Trams are just 100 metres away and provide a direct connection to Dresden’s Old Town. 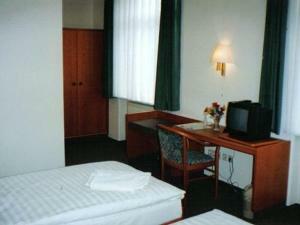 Each room at the Hotel Fliegerhorst has a TV, refrigerator and private bathroom with hairdryer. Guests can also book an apartment with kitchenette. In the evening, Czech and Bohemian specialities are served in the Restaurace Praha restaurant. Located in the green Hellerau district of Dresden, the Fliegerhorst is just 100 metres from the Festspielhaus Hellerau Tram Stop. The A4 motorway is just 5 minutes away and free parking is available on site. 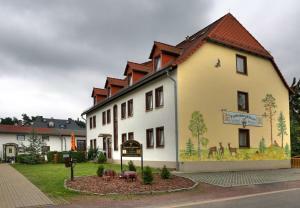 This family-run hotel enjoys a quiet location in the Löbtau district, a 10-minute drive from Dresden city centre. Hotel Burgk offers modern rooms with free Wi-Fi, and free on-site parking. All rooms at the Hotel Burgk Dresden feature cable TV, a seating area and a bathroom. A breakfast buffet is available each morning at Hotel Burgk Dresden. The hotel bar is open in the evenings. The Bünaustraße tram stop is 500 metres away. This offers a direct connection to Dresden Main Station and the Old Town with the Semper Opera, Zwinger Palace and the Frauenkirche church. This hotel with non-smoking rooms is in an exclusive residential area, 9 km north of Dresden’s Old Town and 3 km from Dresden Airport. It offers an underground car park. All rooms at the 3-star Point-Nichtraucherhotel feature cable TV and a private bathroom. A daily breakfast buffet is available in the Nichtraucherhotel from 07:00 - 10:00 on weekdays. The El Toro steakhouse restaurant serves steak, fish, salads and wines. Dresden-Klotzsche S-Bahn (city rail) station is just a 4-minute walk from the Point Nichtraucher. 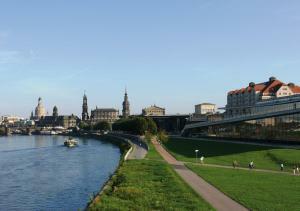 Dresden’s Old Town is 10 minutes away by train. There is a bus and tram stop just steps from the Nichtraucherhotel. The A4 motorway is a 3-minute drive away. A bed Privatzimmer Dresden provides budget, non-smoking accommodation in functionally decorated rooms with a television. Local attractions include the Marienbrücke (bridge), the impressive Frauenkirche (Church of Our Lady) and the numerous pubs of the Dresdner Neustadt (Dresden New Town). The Neustadt‎ S-Bahn (city rail) station is also just a short walk from the guest house, making all areas of the city easily accessible. Guests are kindly asked to ensure that they check in between 16:00 and 20:00. 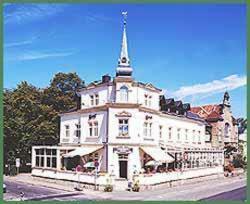 This historic hotel is located on the edge of the Dresdner Heide nature reserve, in the Saxon capital of Dresden. The Kurhaus Klotzsche was built in the 19th century and is set in peaceful surroundings on the outskirts of the city, whilst still being within easy reach of what Dresden has to offer. Enjoy a range of regional Saxon dishes and international specialities in the hotel restaurant. In the summer months you can linger on the hotel terrace. 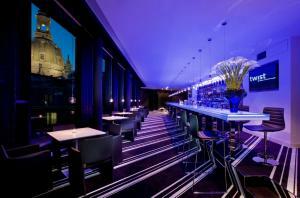 The hotel bar is also the perfect place to unwind after a rewarding day’s sightseeing. All guests staying in the Kurhaus Klotzsche enjoy free wireless internet access. 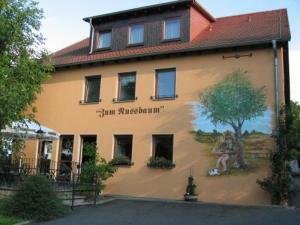 This charming hotel is peacefully located in the east of Dresden. Enjoy a delicious breakfast buffet, at no extra charge, before taking the direct tram connection into the city centre. The Gutshof Hauber offers comfortable rooms with modern amenities. Dine in the Hauber's restaurant where you will enjoy regional, national and seasonal specialities. Compliment these with local beers and selected wines. The Gutshof Hauber boasts a lovely, quiet inner courtyard. Dine here in the summer or just sit back with a drink and enjoy the sun during the day. There are free parking spaces in the hotel's courtyard. Leave your car here and reach Dresden in only 20 minutes using the convenient, direct tram connection from right outside the hotel. Alternatively, take out one of the hotel bikes and ride along the Elberadweg cycle path. Spacious studios and good transport links await you in Dresden's lively Neustadt district. Wi-Fi is available in the Alte Remise's breakfast room for no extra charge. Hotel Alte Remise offers studios with natural wood floors, a small lounge, kitchenette and allergy-free bed linen. Both modern and antique furniture is used, and bathrooms feature natural daylight. Fresh bread rolls, butter and a selection of jams and marmalade are served for breakfast each morning. Breakfast is included in the price. For lunch and dinner, visit the many restaurants and bars right outside the hotel. The Hotel Alte Remise offers free secure parking for cars and motorbikes (for an extra fee during the day). Secure storage space for bikes is also available. Neustadt railway station is a 10-minute walk away and trams are nearby. Situated in the historic Neustadt district of Dresden, this 4-star hotel offers tastefully furnished rooms, free Wi-Fi and a spa area with an indoor swimming pool. All of the elegant rooms at the Rothenburger Hof feature a range of modern amenities, such as an en suite bathroom and high-quality furniture. Wake up to the Rothenburger Hof's breakfast buffet, which is served each morning in the Markgrafengarten breakfast restaurant. In the evenings, you can try tasty regional cuisine in the hotel's Saxon restaurant. Relax and pamper yourself in the Rothenburger Hof's spa area, where you will find a steam room, a sauna and an indoor swimming pool. Active guests will appreciate the modern fitness studio. Dresden's historic Old Town district is less than 2 km away from the hotel, and is easily accessible via public transport. This non-smoking hotel in the Cotta district of Dresden offers Oriental-style rooms, big breakfast buffets, and easy tram connections to the city centre. The A4 motorway is 1.5 km away. All of the soundproofed rooms face either the street or the peaceful courtyard. All include a flat-screen TV with satellite channels, air conditioning and free tea/coffee facilities. Wi-Fi is available in all areas of the Hotel Aviv. The Flügelweg tram stop is a 1-minute walk from the Aviv Dresden. Trams run to the famous Semper Opera House in 20 minutes. Just a 10-minute walk from the Großer Garten Park and Dresden-Strehlen S-Bahn (city rail) Station, this boutique hotel offers free parking, free Wi-Fi, and individually furnished rooms with flat-screen TVs. A varied breakfast buffet is provided every morning at Boutique Hotel Villa Gast. The themed rooms at Boutique Hotel each feature a radio and have a private bathroom with bathrobes and a hairdryer. Some have a balcony or terrace. Dresden’s historic Old Town with the famous Frauenkirche Church is just a 10-minute drive from Hotel Villa Gast. Cäcilienstrasse Tram Stop just 100 metres from the hotel, and the A17 Motorway is 3.5 km away. Located directly opposite Dresden Central Station, this hotel offers soundproofed rooms with flat-screen TV, traditional Saxon cuisine, and free Wi-Fi access up to 256 KB/s. Guests enjoy free use of local public transport. 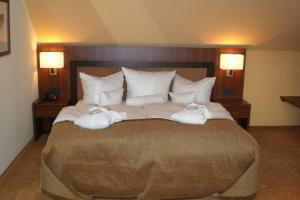 The air-conditioned rooms at the InterCityHotel Dresden are decorated in warm, natural tones. All include a minibar, desk, and private bathroom with cosmetic mirror. Regional and international specialities are served in the InterCityHotel’s modern restaurant. Fine cocktails are mixed in the stylish bar. The Baroque Old Town district is a 10-minute walk from the Dresden InterCityHotel. The famous Semper Opera House is about 10 minutes away by tram. Established as a public bar by a local blacksmith in 1841, the Gasthof Coschütz first offered rooms to visitors in 1879. Since this point, the hotel has provided guests with a great base to explore everything the historic city of Dresden has to offer. The hotel also has rooms for family celebrations and groups of up to 120 people. 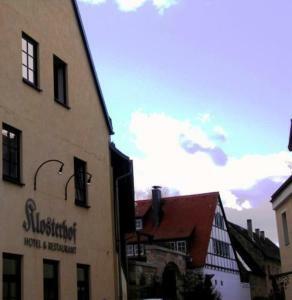 This hotel in North Dresden offers free parking, and a rustic cellar restaurant. 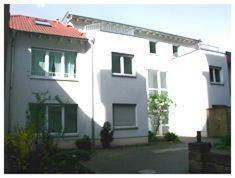 It is a 1-minute walk from trams and a 5-minute drive from the A4 motorway. 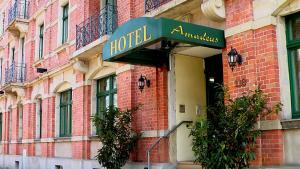 The privately run Hotel Amadeus has bright rooms with satellite TV and desks. A free internet terminal is available in the lobby. Hotel Amadeus's Papageno restaurant serves German and Mediterranean food. A rich breakfast buffet is also available each morning. The adjacent Trachenberger Platz tram stop connects you to Dresden Central Station and the city centre in 15 minutes. Located in a 400-year-old building beside the River Elbe in East Dresden, this family-run hotel offers free Wi-Fi and an Italian restaurant with river views. Dresden’s Old Town is a direct tram ride away. Ristorante e Pensione La Campagnola has individually furnished rooms with wooden furniture. Each room has a private bathroom, TV set and some offer expressionist-style décor. Guests can try homemade Italian specialities while enjoying the view from the panoramic windows. Meals are also served in the rustic wine cellar, the bright conservatory, or the idyllic courtyard garden. La Campagnola stands beside the Blue Wonder Bridge, a 3-minute walk from the Schwebebahn (monorail train) and a 10-minute walk from the Schillerplatz Tram Stop. The countryside of the Dresden Heath begins 2 km away. Set in a historical building with a pretty courtyard, this hotel with free parking is just 500 metres from Neustadt Train Station and a 10-minute walk from Dresden’s Old Town. 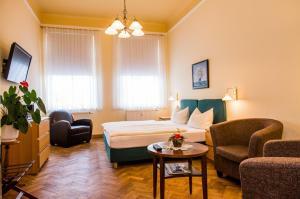 Hofgarten 1824 offers bright rooms with free Wi-Fi, wooden flooring and a private bathroom with shower. TVs with satellite channels are available on request and at additional cost. A varied breakfast is provided every morning at Hofgarten 1824 Dresden. Guests can enjoy fine beers and wines outside on the green inner courtyard. Located next to a scenic park, Hofgarten 1824 is just a 5-minute walk from shops and museums. There is a tram stop just 50 metres away, providing connections to all parts of Dresden. A 5-minute drive from the A4 motorway and a 10-minute drive from Dresden city centre, this small guest house offers free parking and individually furnished rooms with iPod docking stations. 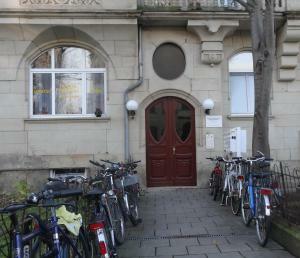 Haus Weinberg lies in the quiet Trachenberge district of Dresden. Each room has a private bathroom with bathrobes, slippers and a hairdryer. Satellite TV is provided, and some TVs are flat-screen. Guests start their day with free newspapers and a breakfast buffet, and free Wi-Fi is available in public areas. A drinks vending machine is available on site. A 4-minute walk takes you to a garden restaurant with wonderful views of Dresden. Weinberg’s garden features a terrace, and there is a children's playground nearby. The surrounding area is ideal for cycling and hiking. The Wilder Mann Tram Stop is a 10-minute walk away, and provides a direct connection to Neustadt Train Station and Dresden’s old town. 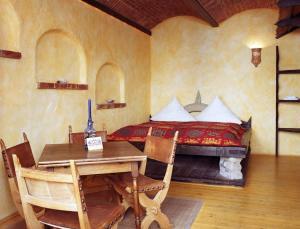 Hotel Dresden Domizil provides brightly decorated rooms with satellite TV, desk, and private bathroom. Saxon specialities and international dishes are served in the Domizil’s restaurant. Full buffet breakfasts are prepared in the mornings. The A4 motorway is just 2 km from the Dresden Domizil Hotel. Dresden Airport is just 5 km away. Dresden Central Station is a 15-mintue direct train (S1) ride away. 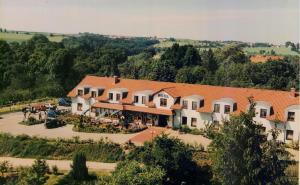 This hotel is quietly located in green countryside, 2 km from Dresden Airport. It is a direct 20-minute tram ride from Dresden’s Old Town. It offers free Wi-Fi and free parking. All modern rooms at the Akademiehotel Dresden feature satellite TV and a private bathroom. Many rooms offer views of the Dresdner Heide (Dresden Heath). Dining facilities at the Akademiehotel include a buffet restaurant and the Bistro Arte à-la-carte restaurant. This serves regional and international food. Guests can also dine on the summer terrace. Wellness facilities at the Akademiehotel include a sauna, massages and a gym. Fitness courses are free from Mondays to Fridays. The Dresden Heath countryside is ideal for jogging, hiking or cycling. Bicycle hire is available. The Akademiehotel Dresden has a cosy sports bar with a large TV. There are 2 skittle lanes and an outdoor boules area which are free for guests. 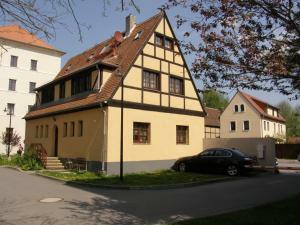 Free private parking is provided at this guest house in the lively Neustadt district of Dresden. Guests enjoys a peaceful location, a 2-minute walk from trams. The non-smoking Pension Helgoländ has bright, simple rooms with a TV, wardrobe and refrigerator. Shared bathrooms and toilets can be found in the hallway. Guests can prepare meals in Helgoländ's small shared kitchen. Many restaurants, cafés and nightlife venues are within a 5-minute walk. The nearby Friedensstraße Tram Stop provides a direct connection to the Staatsschauspiel Dresden (theatre) and the Großer Garten (park). Dresden-Neustadt Train Station is 1 km away. - From Dresden Neustadt railway station, take tram number 11 towards Bühlau. - Get off at the Weißer Adler stop. 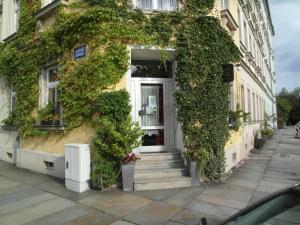 - From there walk back towards the city centre, and you will find the hotel on Bautzner Landstraße. - Coming from the A4 motorway, take the Dresden/Hellerau exit and continue towards the city centre. - At the second traffic lights turn left towards Radeberg/Pillnitz/Bergbahn. - After the pedestrian traffic lights (about 200 metres after the bend) turn left onto Kurparkstraße. - You will find the hotel entrance 40 metres ahead on the right hand side. Featuring a restaurant serving south-east Asian specialities, this hotel is situated in the district of Cossebaude. It offers soundproofed rooms and free WiFi. Cossebaude Train Station is a 5-minute walk away. The modern rooms at Hotel Am Friedensstein come with cable TV, a work desk, and a private bathroom. Fresh ingredients are used to create the Asian dishes served in the Bali Restaurant, and guests can dine in the bright restaurant or on the terrace. A buffet breakfast is available each morning. The centre of Dresden is 9.5 km from Am Friedensstein, and features the Frauenkirche Church, the Zwinger Palace and the Semperoper Opera House. The train station provides connections to Dresden Main Station in 15 minutes. The A4 motorway is 3.5 km away, and Dresden International Airport is a 20-minute drive away. Free parking is available. This hotel is located in the heart of Dresden’s lively Neustadt district. Cityhotel Stadt Dresden offers an indoor pool and spa area, free Wi-Fi and a children’s playground. A flat-screen TV with satellite channels and a minibar are provided in each air-conditioned room. Decorated in warm tones, the bright and spacious rooms feature soft lighting and solid wood furniture throughout. A rich buffet breakfast is served daily for an additional charge in the partner hotel, the Rothenburger Hof. A gym, sauna and steam room can also be found in the hotel. Dresden’s popular sights include the Semper Opera House and Frauenkirche Church both located 2 km away. Bautznerstrasse tram stop is only a 2-minute walk from Cityhotel Stadt Dresden and offers a direct route to the Old Town. This 4-star hotel offers free Wi-Fi internet, free parking and a sauna in the Striesen district of Dresden, near the Großer Garten park. Dresden’s Old Town is 4.5 km away. The Hotel Smetana’s tastefully furnished rooms are available in a number of different styles, ranging from classic to modern. During the afternoons, guests can help themselves to free soft drinks, hot drinks and cakes at the Smetana's reception. 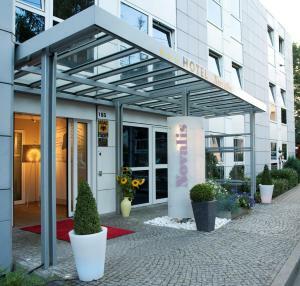 This hotel is located in the Cossebaude district of Dresden, just 6 km from the city centre. It offers quiet rooms, free Wi-Fi and excellent links with the A4 motorway. The Hotel Zur Post's rooms include a private bathroom, satellite TV channels and free Wi-Fi. A breakfast buffet is available each morning in the Hotel Zur Post's bright conservatory. There is also an on-site café serving homemade cakes, pastries and hot drinks. Guests are welcome to use the Hotel Zur Post's sauna. Massages and cosmetic treatments are also available on request. Parking is free at the Hotel Zur Post. 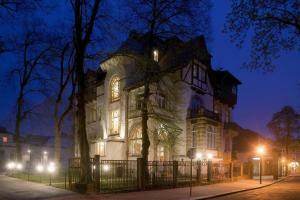 This hotel is located in Dresden Klotzsche, set in a listed building dating back to 1896. Due to its central and convenient location, you can easily reach the historical city center and nearby attractions. There are many shops and bakeries situated nearby. This 3-star hotel is located in the Seidnitz district of Dresden. It offers comfortable rooms, a traditional restaurant serving regional cuisine, and free Wi-Fi throughout the building. All of the non-smoking rooms at the Hotel An der Rennbahn have a private bathroom. The Hotel An der Rennbahn's large breakfast buffet includes sparkling wine. In summer months, breakfast can be enjoyed in the hotel garden. The Rennbahn's restaurant offers Saxon and Mediterranean specialities. The Hotel An der Rennbahn offers a sightseeing bus service. More information will be provided at the hotel. The Dresden-Reick S-Bahn (city rail) station is just 600 metres away, providing a link to the main railway station in 5 minutes. The city centre can be reached in 15 minutes by tram. This 4-star hotel is an 18th-century building located 500 metres from the River Elbe, opposite Dresden’s historic Old Town district. Hotel Bülow Residenz offers free use of the neighbouring Bülow Palais spa and fitness centre. Hotel Bülow Residenz Dresden is one of the oldest manors in Saxony. Free wired internet is provided in the Baroque-style rooms and suites, which are richly decorated with red and gold colours. A flat-screen satellite TV, seating area and free Wi-Fi come as standard. A buffet breakfast is served each morning in the elegant restaurant with its chandelier, valuable antiques, large panoramic windows and lush red carpet. Breakfast can also be served in the covered courtyard in summer. The accommodation is just metres from Hotel Bülow Palais, where guests are welcome to use the underground parking spaces, spa and fitness area, as well as dine in the Caroussel restaurant and in Bülow's Bistro. Guests are within a 15-minute walk of all Dresden’s Old Town attractions, including the Semper Opera, Zwinger Palace and Frauenkirche Church. Dresden-Neustadt Train Station is 750 metres away. Just 4 km from Dresden’s beautiful city centre, this peaceful hotel occupies an over 200-year-old villa within a 3,000 m² estate. It is a 10-minute walk from the Baroque Großer Garten park. Villa Seraphinum offers elegant, individually furnished rooms. Rooms offer views of the surrounding garden with its ancient trees. A full breakfast buffet is served each morning. Several restaurants can be found within a 3-minute walk. It is a 7-minute drive or 15 minutes by public transport to Dresden's Old Town with the Semper Opera the Zwinger Palace and the Frauenkirche Church. A bus and tram stop lie just a 3-minute walk from the hotel. 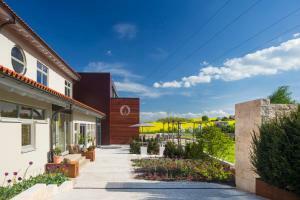 Set in a renovated, 19th-century building this modern guest house is located on the outskirts of Dresden. It offers a restaurant and cosy accommodation with internet access. Rich carpets and dark wooden furniture feature in the each of the bright rooms at Pension Luft. All rooms are equipped with a flat-screen TV, minibar and a private bathroom with heated towel rails. Downstairs in Restaurant Schnizz, guests can enjoy traditional German schnitzel dishes. Guests have the choice between a sweet or savoury breakfast. A 15-minute drive into Dresden’s Old Town and visitors can explore sights such as the Semper Opera House and Frauenkirche Church. The Elbamare Spa is also just 2 km away. A tram stop is located opposite Pension Luft, and offers direct links to Dresden Central Station (15-20 minute ride). 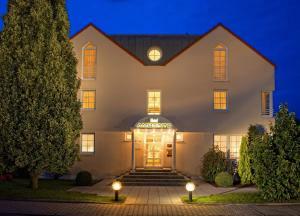 This 4-star hotel is on the Leubnitzer Höhe hill in the quiet Leubnitz-Neuostra district of Dresden. It offers an elegant spa with gym, and easy access to the A17 motorway. Each room at the Wyndham Garden Dresden features satellite TV, a work desk, and a free bottle of water. All rooms offer free Wi-Fi. Guests are welcome to use the Wyndham Garden Dresden Top-Fit-Club with sauna, steam room, and hot tub. Traditional Saxon food and international dishes are served in the Wyndham's restaurant. Other facilities include the Piccolino bar and park terrace. The A17 motorway is just a 5-minute drive from the Wyndham Garden Dresden. Dresden’s historic city centre is 5 km away. This 3-star hotel in located in central Dresden, 3 km from the Congress Centre and a 10-minute walk from Dresden Main Station. It offers a daily breakfast buffet and free Wi-Fi. Each of the contemporary-style rooms at the Days Inn Dresden includes satellite TV, a work desk, and a modern bathroom. Guests are welcome to relax with a snack in the Days Inn’s bar throughout the day. Free public parking spaces are available near the Days Inn Dresden. Situated Dresden Castle in the heart of Dresden’s Old Town, this hotel offers a gym, spa, and elegant rooms with free Wi-Fi. It is 200 metres from the Semper Opera and 500 metres from the Frauenkirche church. Swissôtel Dresden Am Schloss has spacious rooms and suites with flat-screen TVs, hot drinks facilities and a choice of pillows. Comforts include bathrobes, slippers and a free bottle of mineral water. Fine international cuisine and local specialities are served in the Wohnstube Restaurant. Guests can enjoy snacks and homemade pastries in the Swissôtel’s lounge, and can end the day with a cocktail in the chic bar. 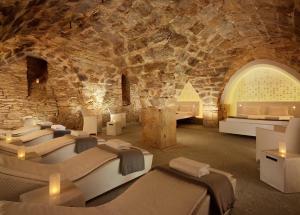 Located in a historic stone cellar, the Pürovel Spa features a sauna and massage rooms. Active guests will enjoy the Alpine-style fitness room. The Altmarkt ‎and Theaterplatz Tram Stops are within 350 metres, providing direct connections to Dresden Central Station and Dresden Mitte Train Station. This comfortable, family-run guest house conveys an Aztec-Mexican ambience and is situated in a central yet peaceful location in Neustadt, the trendy area of Dresden. The Old Town and the River Elbe can be easily reached on foot, while Dresden's vibrant nightlife can be found right near Gästehaus Mezcalero. The rooms come in various categories and are individually furnished. There is a communal TV room for some social evenings. Situated only 50 metres from a tram stop (lines 7, 8 and 13) and 10 minutes walk from Neustadt Train Station, Gästehaus Mezcalero is the ideal base for day trips within Dresden or into the surrounding area. Our 3,500m² large hotel grounds feature comfortable seating areas with a fireplace grill, table tennis and 2 sunbathing lawns, one in front of and one behind the hotel. This family-run hotel is located in the Äußere Neustadt district of Dresden. It offers well-equipped rooms, a restaurant serving healthy food, and a breakfast buffet each morning. All of the non-smoking rooms at the Das Nichtraucherhotel PRIVAT include high-speed internet access and a modern bathroom. Some rooms have a balcony or a bay window. The Das Nichtraucherhotel PRIVAT's restaurant serves healthy international food. The hotel also offers a wide variety of wines in the vaulted cellar. Many massages and cosmetic treatments are available at the Nichtraucherhotel, such as Ayurveda massage and aromatherapy. The nearest tram stop is just 400 metres away. 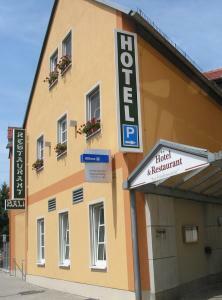 This conveniently located hotel provides a comfortable home base in Dresden's southern district of Lockwitz. The Baroque city centre is about 20 minutes away by car or public transport. The privately run Residenz am Schloss offers attractively furnished, en-suite rooms which are decorated in soothing colours and feature free Wi-Fi internet access. From the bus stop directly outside guests can reach Dresden's city centre and old quarter in approximately 20 minutes. Attractions include the world-famous Semperoper opera house. The A17 motorway's Dresden Prohlis and Heidenau exits are only about 2 kilometres away, promising relaxing day trips within Saxon Switzerland. Free on-site parking is provided. 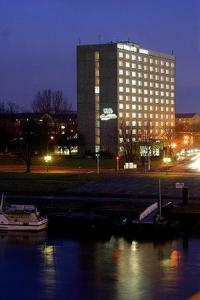 This Holiday Inn is located in the Neustadt district of Dresden, just 4 km from the Baroque city centre. It offers air-conditioned rooms, a modern restaurant and an indoor pool. Each room at the Holiday Inn Dresden has Sky TV channels, coffee/tea facilities and Wi-Fi internet access. Stephans restaurant has an open cooking station, and offers à la carte cuisine and themed buffets. Exotic cocktails, German beers and small snacks are served in Stephans Bar & Lounge. Guests can use the Holiday Inn Dresden’s body&soul spa. Facilities include an indoor pool, a Finnish sauna and a modern fitness room. Free parking spaces can be found next to the hotel, and the Stauffenbergallee tram stop is just 300 metres away. Each morning guests at the Fuchsbergklause can sit down to a fresh breakfast buffet. The pub restaurant, decorated with stuffed animals, serves a selection of regional Saxon dishes and game specialities. All non-smoking rooms come with a TV, minibar and telephone. Private bathrooms include a hairdryer. The A4 motorway can be reached in 10 minutes, offering connections to Dresden’s city centre in half an hour. Fuchsberg Train Station 7 minutes away by foot. This 3-star superior hotel in Dresden is set on the Elbradweg bicycle route beside the River Elbe. It offers a sauna with panoramic balcony, soundproofed rooms and WiFi. The modern rooms of the Mercure Hotel Dresden Elbpromenade include satellite TV and bathrooms with bathtubs. Traditional Saxon dishes and international meals are served in the Mercure Dresden’s Canaletto Lounge restaurant with terrace. Guests can also relax in the conservatory and the BaRock lobby bar. Leisure facilities at the Mercure Dresden Elbpromenade include a steam room and bicycle rental service. Outdoor and underground parking is available at the Mercure Elbpromenade. Dresden's historic city centre is just 10 minutes away by car. Our hotel is located amidst German’s largest concentration of luxury villas in the Dresden suburb of Weißer Hirsch, lovingly referred to by locals as the balcony of the city. Here you will find a tranquil setting surrounded by swathes of natural countryside, whilst enjoying convenient public transport access to the city centre, just a quarter-of-an-hour away by tram. This makes our hotel the ideal base for anyone wishing to explore the beautiful world-heritage city of Dresden. 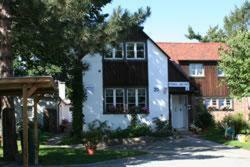 This family-run guest house is quietly located just 600 metres from Dresden Heath. Pension Arcade features free Wi-Fi, luggage storage and a large garden. The bedrooms are soundproofed and come with a TV, large desk and en-suite bathroom with a hairdryer. The apartment offers a fully-equipped kitchen with a dishwasher, a balcony, and laundry facilities. A breakfast buffet is served every morning in the dining area. Dresden city centre is 8 km from Pension Arcade, and features a variety of dining options. Free parking is available and the A4 motorway is a 15-minute drive away. Dresden Main Station can be reached in 10 minutes by car, with direct connections to Berlin and Chemniz. This design hotel features free Wi-Fi, a terrace, and unique rooms with artistically decorated interiors. 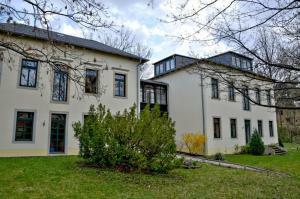 Located in a calm area of Dresden, it is set by the picturesque Priessnitz River. 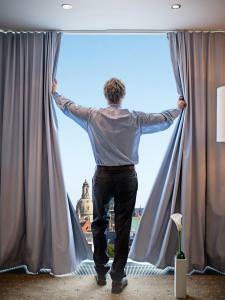 Dresden’s historic city centre can be reached from Backstage Hotel within 10 minutes’ walk. Sights like the Semperoper Opera House and Frauenkirche Church can be reached within 3 km. The hotel is located 4.5 km from Dresden Central Train Station and there is an underground car park available for an additional fee. Offering a terrace and spa centre, Hilton Dresden is set in Dresden in the Saxony Region, 100 metres from Frauenkirche Dresden. The hotel has a hot tub and sauna, and guests can enjoy a meal at the restaurant or a drink at the bar. Some rooms include a seating area to relax in after a busy day. You will find a kettle in the room. The rooms are fitted with a private bathroom with a bath and shower, with bath robes and slippers provided. Extras include free toiletries and a hair dryer. Hilton Dresden features free WiFi . A TV with cable channels is featured. 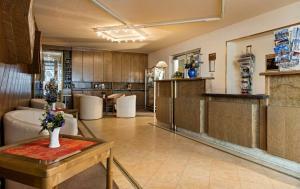 There is a 24-hour front desk, a cash machine, gift shop, and shops at the property. Zwinger is 200 metres from Hilton Dresden, while Gruenes Gewoelbe is 300 metres from the property. The nearest airport is Dresden Airport, 8 km from Hilton Dresden. Vineyards and a lovely Baroque park surround this 4-star hotel in Dresden’s Radebeul district. It provides pure relaxation in the luxury spa with 25-metre pool as well as in the large rooms with free Wi-Fi. The classically decorated rooms at Radisson Blu Park Hotel come complete with satellite TV and paintings by local artists. You’ll also find a seating area and large, floor-to-ceiling windows. The Radisson’s large spa spans 1000m² and features a swimming pool, a Finnish sauna and fitness facilities. Guests are invited to book a session in the beauty salon while kids will enjoy the large playground and the indoor playroom. Featuring a terrace with a view of gardens and vineyards, the stylish Lössnitz restaurant serves international favourites. Refreshments are offered in the Nizza bistro, and you can relax with a drink at the Karl May bar. Ideally located to discover the surrounding, Dresden’s historic city centre is just 20 minutes away by tram. The local bus stop is also only 100 metres away. A free transfer is available to Radebeul-Ost Train Station, 1.5 km away. This 4-star hotel in Dresden offers modern rooms and a leisure area with indoor pool. 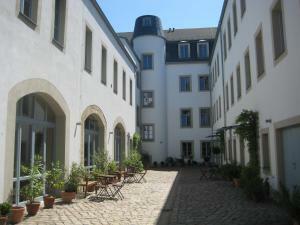 It is a 10-minute walk from the Frauenkirche church and 2.5 km from Dresden Main Station. All rooms at the Dorint Hotel Dresden have a large bathroom, a minibar and cable TV. The comfort rooms have tea/coffee making facilities. A rich breakfast buffet is served each morning in The Gallery, and The Brücke restaurant offers light Mediterranean cuisine and fine wines. Hearty local dishes are served in the Alt Dresden pub. Guests can enjoy a drink in the lobby bar or smoker’s lounge. Guests enjoy free use of the Dorint Dresden’s Aqua Spa, which features a sauna, steam bath, hot tub, fitness room and Kneipp foot bath. Massages can also be booked for an extra fee. Wired internet or Wi-Fi is available in all rooms. Guests can use the internet terminal in the lobby for free. Rental bicycles, a charming garden and 24-hour reception are offered by these unique apartments. 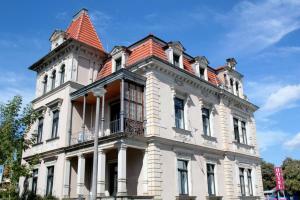 Located in the Cotta district, they are just 3.5 km from Dresden’s historic Old Town. 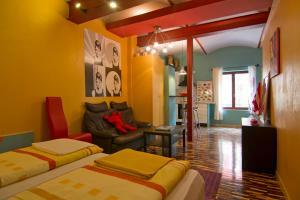 Art Apartments features bright and colourful apartments inspired by the artists Hundertwasser and Andy Warhol. Each consists of an open-plan living/ bedroom with a flat-screen TV, atmospheric lighting and modern artwork. Guest can prepare meals in the apartment’s fully equipped kitchen. Restaurants serving traditional German dishes and international cuisine are less than a 5-minute walk from Art Apartments. Dresden’s main attractions such as the Semper Opera House and Zwinger Palace can be reached within a 10-minute drive of Art Apartments. Dresden Exhibiton Centre is 4.5 km away. Art Apartments are conveniently situated just 50 metres from Pennricher Straße tram stop. This provides easy connections around the city. Enjoying a peaceful location in a beautiful park to the west of Dresden, this 4-star hotel offers convenient motorway and rail connections to the city centre. The Hotel Villa Weltemühle Dresden provides cosy accommodation in spacious rooms and maisonette suites which feature elegant interiors and a view of the park. Enjoy an aperitif in the library before the crackling fireplace in the bar or in the wine lounge. Pamper yourself in the spa area of the Hotel Villa Weltemühle Dresden. Relax in the Finnish sauna and steam room, have an Ayurvedic massage, or visit the beauty farm. The hotel’s peaceful surroundings and easy access to Dresden make the hotel an ideal getaway or business address. Innside by Meliá Dresden’s air-conditioned rooms and suites include a minibar and free wired internet. The modern bathrooms feature a rain shower, bathrobes and toiletries. Guests at the Innside by Meliá Dresden enjoy free use of the wellness area, featuring 2 saunas, a steam bath and fitness studio. Beauty treatments and relaxing massages can be booked here. German and international dishes are offered at the chic, high-ceilinged VEN restaurant. Exotic cocktails can be enjoyed at the cocktail bar with separate smoker’s lounge. The hotel is just a 3-minute walk from the Synagoge tram stop, which provides connections to Dresden Main Station in just 5 minutes. Situated on the River Elbe between Dresden’s Old Town and the Weißer Hirsch district, this elegant hotel is a 19th-century Tudor-style palace along the upper bank of the River Elbe. It is set in 15 hectares of parkland, surrounded by ancient trees. 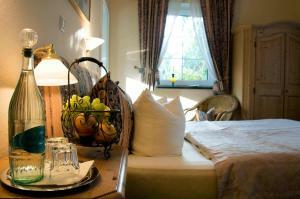 Hotel Schloss Eckberg offers exclusively furnished rooms in the castle with high-class furnishings, and antiques. Some rooms are situated in the Cavalier's House in the park, just 200 metres from the main building. The Hotel Schloss Eckberg features 3 saunas, a fitness room and a beauty salon, all located in the Cavalier's House. A variety of select packages and treatments are also available. The stylish Schlossrestaurant serves a rich breakfast buffet, lunches, afternoon coffee with regional pastries as well as elegant dinners. A tram stop is just 150 metres from the hotel, takes you to Dresden’s Old Town in 15 minutes. Many free parking spaces are also available. 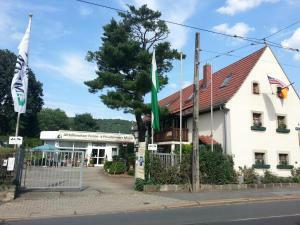 The hotel is 4.5 km from Dresdner Neustadt Train Station and 7.3 km from Dresden Main Station. It is 5.5. km from the Dresden Exhibition Centre and 10 km from the Hellerau motorway exit. Elegant rooms and suites with floor-to-ceiling windows and a flat-screen TV are provided at the Westin Bellevue Dresden. Decorated in soft cream colours, rooms feature a safe and a bathroom with bathtub and shower. A rich breakfast is served in the Palaisrestaurant with terrace. Mediterranean cuisine and river views are offered by the elegant Canaletto restaurant. Guests can enjoy cocktails in the Café-Bar Pöppelmann. In the summer, the Elbsegler beer garden is open and offers cool beer and barbecue specialities. The grand BellAcqua spa features a Finnish sauna, steam sauna and solarium. Guests can book Ayurvedic massages and beauty treatments..
A 2-minute walk away, the Neustädter Markt Tram Stop provides a direct connection to Dresden Central Station. Semperoper Opera House and the Zwinger palace are a 10-minute walk away. This 5-star-superior hotel with original Baroque façade stands beside Dresden's famous Frauenkirche Church. It offers stylish spa facilities and free WiFi in all areas. The soundproofed rooms at Hotel Suitess are decorated in a 19th-century style. All include a flat-screen TV, CD/DVD player, and bathroom with Italian marble. An exclusive breakfast is served in the Suitess’s restaurant. 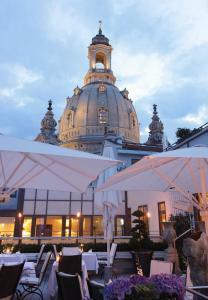 In warm weather, guests can dine on the rooftop terrace overlooking the Frauenkirche. Exclusive spa treatments, a hot tub, and a sauna area are available at Hotel Suitess. Guests enjoy views of the dome of the Frauenkirche Church. Hotel Suitess is just a 10-minute walk from the Semper Opera House and Zwinger Palace. The 24-hour reception can book private chauffeurs. This 4-star hotel lies on the Altmarkt Square in Dresden’s Old Town. 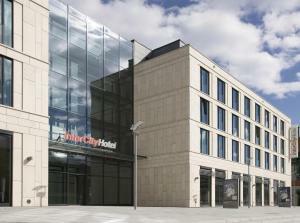 The NH Dresden Altmarkt offers modern rooms with free Wi-Fi and a flat-screen TV as well as a gym with a roof terrace. The bright and spacious rooms at the NH Dresden Altmarkt feature classic décor with dark wood interiors and floors. All rooms are air-conditioned and include a desk. A full breakfast buffet and a selection of Spanish and German meals are served in the elegant restaurant with its beige and red colour schemes. Guests are also welcome to relax in the contemporary-style bar or in the cigar lounge. The NH Altmarkt is a 3-minute walk from Prager Straße tram stop and a 15-minute walk from Dresden Main Station. The Frauenkirche Church, the Zwinger Palace and the Semper Opera are within a 10-minute walk. 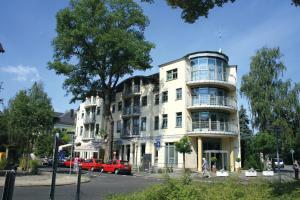 This hotel is in the Neustadt district of Dresden, close to many bars, shops and restaurants. It offers stylish rooms, a traditional cellar bar, and good tram connections. The rooms and interiors at the Tryp by Wyndham Dresden Neustadt are brightly furnished. All rooms offer cable TV and free Wi-Fi. The Friedensstraße tram stop is directly in front of the Tryp by Wyndham Dresden Neustadt. Dresden’s Frauenkirche church, Semperoper opera house and the Zwinger Palace are 15 minutes from here by tram. A breakfast buffet is available at the Tryp by Wyndham Dresden Neustadt until 11:00 each morning. The cellar bar serves drinks and snacks. Guests enjoy free on-street parking near the Tryp by Wyndham Dresden Neustadt. This hotel offers well-equipped, non-smoking apartments with free WiFi in the heart of Dresden’s Old Town. Aparthotel Neumarkt lies on the historic Neumarkt Square, directly opposite the Frauenkirche Church. 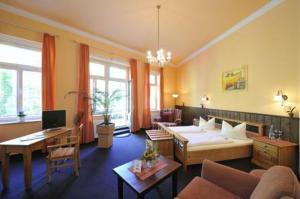 The spacious apartments at the Aparthotel Neumarkt Dresden are brightly furnished. All apartments include a living and sleeping area, a washing machine and a fully equipped kitchen. The Aparthotel is within a 5-minute walk of all Dresden’s Old Town attractions, including the Semper Opera and the Zwinger Palace. Guests can explore the River Elbe Terrace around the corner from the apartments. A buffet breakfast is served at the Restaurant Gasthaus Am Neumarkt, 120 metres away. Pirnaischer Platz tram stop is 300 metres away, offering quick connections to all parts of Dresden. This hotel lies in Neumarkt square, in the heart of Dresden. It offers elegant rooms, free Wi-Fi, a wellness area and large summer terrace with views of the famous Frauenkirche church. All the air-conditioned rooms at the Steigenberger Hotel de Saxe feature cable flat-screen TV, minibar and laptop safe. Tea/coffee facilities are included. The Hotel de Saxe offers a sauna, gym and a massage and beauty salon. The Steigenberger in Dresden offers a rich breakfast buffet each morning. Healthy regional and international cuisine is served in the Restaurant de Saxe which can be enjoyed on the balcony. The famous Royal Palace, the Zwinger, the Semper Opera House and Albertinum Museum in Dresden’s Old Town are all within a 8-minute walk from the Steigenberger. Centrally located on Altmarkt Square, this non-smoking hotel in Dresden offers soundproofed rooms with tea/coffee facilities, large buffet or continental breakfasts, and underground parking. The reception is open 24 hours a day. The Holiday Inn Express Dresden City Centre has air-conditioned rooms with flat-screen TV, safety deposit box, and seating area. Wi-Fi is available request. Guests can enjoy breakfast in the Holiday Inn’s classical-style dining room with summer terrace. Fine drinks and liqueurs are served in the elegant bar. The historic Frauenkirche Church is only a 10-minute walk from the Dresden City Holiday Inn Express. The Prager Straße tram stop is directly opposite the Holiday Inn. Featuring an outdoor pool, spa facilities and a garden, this family-run guest house lies just 6 km from the centre Dresden. It offers a terrace and free wired internet. The individually decorated rooms and apartments at Hotellerie&Spa "einfach schön" are furnished in natural materials, and include satellite TV and a seating area. Each has a private bathroom with a shower. Guests are welcome to make use of the barbecue facilities at the guest house, while an optional breakfast buffet is available for an extra charge. The apartment comes with a well-equipped kitchen. Visitors can relax in the saunas at Hotellerie&Spa "einfach schön", and massages can also be booked for an additional fee. The Zschonergrund nature reserve is just 500 metres away. Dresden Train Station is 8 km from the guest house, and the A4 motorway is 5 km away. Free private parking is available on site. Only a 4-minute walk from the banks of the Elbe River, this family-run guest house offers a peaceful location in Dresden. Features include a garden, free WiFi and rental bikes. The individually furnished rooms at Gästehaus Matthias include satellite TV, a seating area and a private bathroom. Apartments also come with a fully equipped kitchen. A breakfast buffet is available, while restaurants and cafés are within a 10-minute walk. A tram stop is located just 150 metres from Gästehaus Matthias, connecting you directly to Dresden’s Old Town. It is 5.5 km to the Frauenkirche Church, and 6.5 km to the Semperoper Opera House. Private parking is available on site for an extra charge. This 3-star hotel is a former palace. Hotel Kim im Park offers daily breakfast buffets and free parking. It is quietly located in the south-west of Dresden. Kim Hotel im Park is surrounded by an attractive park. This is ideal for walking or jogging. The Luckner Parkrestaurant offers international specialities and local wines. The large terrace is open during the summer. The centre of Dresden is just a 10-minute drive from the Kim Hotel im Park. Trams to the city are just a 10-minute walk away. 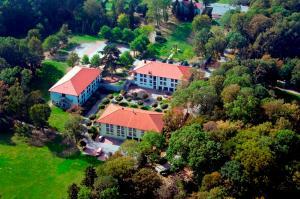 The Kim Hotel im Park is just seconds from the A17 motorway. This provides direct access to the Sächsische Schweiz (Saxon Switzerland) region. This 4-star hotel is an elegant residential building in Dresden’s Neustadt district, 6 tram stops from Dresden’s Old Town. The Plaza Dresden offers free Wi-Fi and 2 restaurants. The bright and spacious rooms at Quality Hotel Plaza Dresden are classically furnished. All rooms include satellite TV, a desk and private bathroom. À la carte German and international dishes are served in the stylish Szenario restaurant with its open kitchen or in the Bibliothek restaurant, overlooking the garden. Drinks can be enjoyed on the terrace, and live piano music is played in La Scala lobby bar. The Dresden Plaza offers free use of the spa with gym, sauna and solarium. A business centre is also available for guests. The Quality Hotel Plaza is a 2-minute walk from Stauffenbergallee tram stop. On-site parking is available and it is a 10-minute drive to Dresden Airport and the A4 motorway. Take the A4 to Dresden, exit at "Hellerau" and after 800 metres you will reach our hotel. By train: 15 min. from the station Dresden-Neustadt. 2.5 kilometers from airport Dresden. Elegant rooms and a classical-style restaurant with conservatory and terrace are featured at this centrally located hotel, just a 5-minute walk from Dresden-Neustadt Train Station and the historic Old Town. Free Wi-Fi is provided. The modern Restaurant Daniel serves seasonal meals from the Saxony region. Local wines can be enjoyed in the elegant vault. Hotel Martha Dresden's rooms feature solid wooden flooring and floor-to-ceiling windows. Each has a radio and private bathroom. Guests can rent bicycles at the Hotel Martha Dresden, ideal for exploring Dresden’s historic Old Town. Sights such as the Japanese Palace, the Frauenkirche Church and the Staatsschauspiel Theatre are just a 5-minute walk away. This hotel is a 5-minute walk from Dresden’s Congress Centre and a 12-minute walk from the Old Town district. B&B Hotel Dresden offers free Wi-Fi and free parking. Rooms at the B&B Hotel Dresden are colourfully decorated and feature air conditioning and soundproofed windows. All rooms include a TV with free Sky channels, as well as a private bathroom with shower. A breakfast buffet is provided each morning in the B&B Dresden’s large dining room. Snacks and drinks are available from the vending machines in reception. The B&B Dresden is a 3-minute walk from the Kongresszentrum tram stop and a 5-minute walk from Dresden Mitte Train Station. Regular trains run to Dresden Main Station from here. Guests are able to check in 24/7 using the check-in machine. This 4-star hotel in Dresden offers free Wi-Fi, air-conditioned rooms and free use of a nearby spa. It is located in Dresden's Neustadt district, a 10-minute tram ride from the city centre. All rooms at the Best Western Macrander Hotel Dresden come with a minibar, free Sky TV channels and tea/coffee-making facilities. The body&soul spa centre is located next door to the Macrander Hotel and offers guests free use of their facilities, including their indoor pool. A rich breakfast buffet is available each morning in the Orangerie restaurant. Guests can enjoy drinks in the Esprit bar. Free on-site parking is provided. Underground parking is available for an extra fee. The nearest tram stop is a 5-minute walk away. 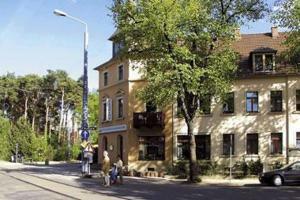 This hotel is 500 metres from Dresden Main Station and a 10-minute walk from Dresden’s world-famous Old Town district. It offers air-conditioned rooms and a 24-hour bar. Renovated in 2011, the classic-style rooms at the Ibis Dresden Bastei feature satellite TV and a private bathroom. WiFi access if available throughout. A full buffet is provided from 06:00 daily in the Ibis Bastei’s breakfast room, which is decorated in red and brown colours. Saxon specialities are served at the neighbouring restaurant. The Ibis Dresden Bastei lies in the Prager Straße shopping street, with good tram and bus connections. The Semper Opera, Frauenkirche Church and Zwinger Palace are a 10-minute walk away. This 3-star hotel offers air-conditioned rooms in the centre of Dresden. 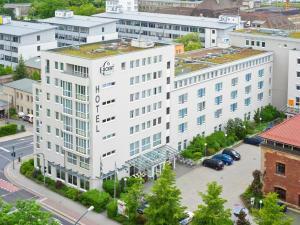 Ibis Dresden Königstein is ideally situated between Dresden Main Station and the Old Town district. All rooms at Ibis Hotel Dresden Königstein were renovated in 2011 and feature a modern design. All rooms include a flat-screen TV with cable channels, a work desk and a private bathroom. The Ibis Dresden Königstein has a 24-hour reception, and snacks and drinks are available 24 hours a day at the bar. The restaurant serves a rich breakfast buffet is served from 04:00 to 12:00, and a selection of German and international cuisine from 17:00 onwards. 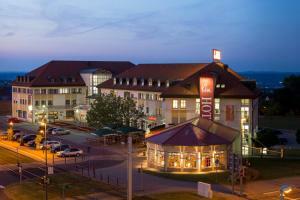 Ibis Dresden Königstein is 5 km from the Dresden Exhibition Centre and 10 km from Dresden Airport. Just 300 metres from Dresden Mitte Train Station, this hotel in the historic Old Town district offers free WiFi, soundproofed rooms, a large restaurant with bar, and excellent transport links. The 3-star L Hotel Dresden Altstadt ‘s brightly decorated rooms each feature a flat-screen TV with satellite channels and hot drink-making facilities. The private bathrooms have a hairdryer. German and international cuisine and a daily breakfast buffet are served in the L Hotel Dresden’s restaurant. A wide range of drinks are available at the bar. Dresden's International Congress Centre and the Semper Opera House are within a 10-minute walk of the hotel. Parking is available for an extra fee. This 3-star, family-run hotel offers free WiFi and free parking in Dresden's Kleinschachwitz district. 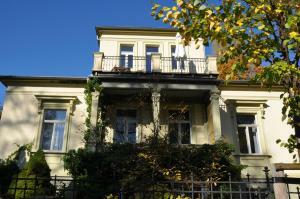 It occupies the former residence of opera singer, Theresa Malten, 150 metres from the Elbe river. 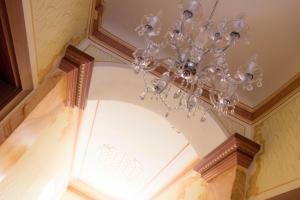 Built in 1892, the protected Therese Malten Villa offers elegant rooms with a mixture of modern and traditional décor. Some rooms include impressive painted ceilings. Guests staying at the Therese Malten Villa have access to the kitchen where breakfast and other meals can be prepared. In the kitchen there is water and beer available for guests (at a minimal cost) as well as Pillnitz wine. From the Villa's garden, guests have beautiful views of the Elbe and of Schloss Pillnitz palace, which is on the opposite side of the river. Dresden's Old Town can be reached in about 30 minutes by tram. There is a tram stop just a 6-minute walk away. This 5-star-superior hotel offers elegant rooms with free Wi-Fi, a 400m² day spa and the Michelin-star Caroussel restaurant. It lies in the heart of Dresden's Baroque district, a 15-minute walk from the Old Town. Combining Baroque and modern charm, the elegant rooms at the Bülow Palais are decorated with warm colours, beautiful fabrics and stylish materials. All rooms include fresh fruit, daily newspapers and a flat-screen TV. Breakfast is served in the light-flooded conservatory. Guests can dine in the gourmet Restaurant Caroussel or enjoy German specialities during the day in the Bülow Palais bistro. There is also a bar area and cigar lounge. The Semper Opera, Frauenkirche church and Zwinger Palace are within 1.5 km of the hotel. Guests can use the secure underground car park. Just 500 metres from the Elbe Cycle Route, this hotel in Dresden offers free Wi-Fi and free private parking. The famous Old Town district is 7 km away. The Adler Hotel Dresden has brightly decorated rooms with satellite TV, a work desk, and a modern bathroom. A varied breakfast buffet is served in the Adler Hotel's breakfast room each morning. 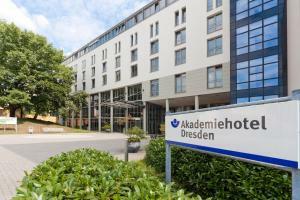 Guests staying at the Adler can reach Dresden-Klotzsche Airport and Dresden-Neustadt Train Station in 10 minutes by car or 30 minutes by public transport. Located in the Radeberger Vorstadt district, this stylish holiday home enjoys a quiet location on the outskirts of Dresden. It offers self-catering accommodation with a small garden and furnished terrace. 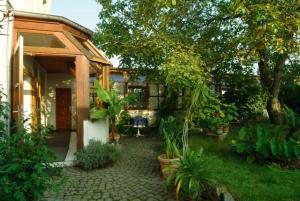 Gartenhaus Auguste consists of 1 bedroom, living room with a sofa bed and a modern bathroom. Bed linen and towels are included in the price. The fully equipped kitchen has a range of appliances including a sandwich toaster, coffee machine and a dishwasher. Grocery shops, bakeries and restaurants are within 500 metres of Gartenhaus Auguste. Popular attractions include Dresden’s Frauenkirche (church) and Zwinger Palace, which are approximately 3.5 km away. Nordstraße tram stop is 500 metres from the propety and offers easy connections to the Old Town. Free private parking is provided by Gartenhaus Auguste. Dresden International Airport is 7 km from the holiday home. This 5-star hotel offers elegant rooms, 3 restaurants and free use of the pool and wellness area. It is next to Dresden Castle, a 5-minute walk from the Frauenkirche Church. Hotel Taschenbergpalais Kempinski offers air-conditioned rooms with Wi-Fi access and satellite TV, and all rooms have a minibar and seating area. The modern bathrooms have a hairdryer. The stylish spa area at Taschenbergpalais features a sauna, gym, and health bar. Massages and beauty treatments are available. French cuisine is served in the Palais Bistro with terrace, and international dishes are available at Intermezzo. Drinks are available at Café Vestibül or in the stylish Karl May Bar, which offers regular live music. Taschenbergpalais Kempinski’s Restaurant and Bar Lesage is located within the modern Volkswagen factory, 3 tram stops away. Altmarkt tram stop is 200 metres from the hotel. 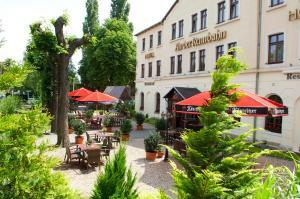 Large rooms, free WiFi and an attractive beer garden are offered by this hotel in Dresden’s quiet Laubegast district. The River Elbe is just a 3-minute walk away. The 3-star-superior Hotel Prinz Eugen provides elegant rooms and apartments with spacious seating areas and floor-to-ceiling windows. Modern comforts include free Sky-TV, a minibar and a safe. Guests begin the day with a large breakfast buffet. This can be enjoyed in Prinz Eugen's bright breakfast room or outside on the peaceful terrace. Drinks are served all day in the stylish bar. A 5-minute walk takes you to a restaurant serving regional cuisine. Trams run to Dresden’s historic centre in 25 minutes from the nearby Laubegast Kronstädter Platz Tram Stop. Free parking is provided. This hotel is located in the heart of Dresden, a 5-minute walk from the Zwinger Palace, Semper Opera and Frauenkirche Church. The ibis Budget offers free Wi-Fi and a 24-hour reception. Rooms at the ibis Budget Dresden City feature a bright and contemporary design. All rooms are air-conditioned and include a flat-screen satellite TV and shower facilities in the room. A breakfast buffet is served in the hotel cafeteria every morning. The hotel is situated in the Altmarkt-Galerie shopping centre, and is surrounded by shops and restaurants. 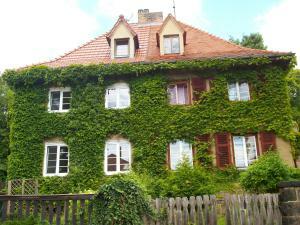 It is 50 metres from Altmarkt tram stop and 500 metres from the River Elbe. Underground parking spaces are available nearby. Dresden Main Station is a 12-minute walk away. 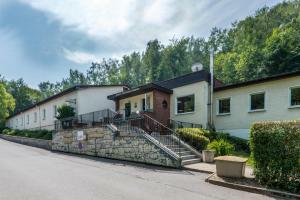 Pension Dresdener Panorama is located in the Gorbitz district of Dresden. Free Wi-Fi access is available in the entire property. A breakfast buffet is served every morning at Pension Dresdener Panorama. 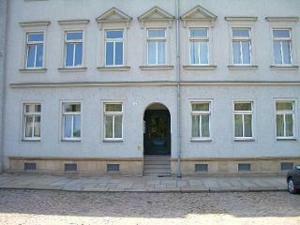 The guest house is 5.5 km from Frauenkirche church, the Altmarkt Square and 5 km from Messe Dresden. Dresden Klotzsche Airport is 12 km away. Pension Dresdener Panorama offers free parking. The A17 motorway is 5 km from the hotel and the nearest bus stop is only 100 metres from the guest house. Offering an indoor pool, a spa and wellness facilities, Hotel Andreas is located in Dresden. There is free private parking available at this hotel. Each of the rooms at Hotel Andreas comes equipped with a TV and a private bathroom with a hairdryer. A fresh breakfast is offered each morning at the hotel, and the on-site a la carte restaurant serves a range of international and regional cuisine. A further selection of restaurants can be found within a 10-minute walking distance of the accommodation. 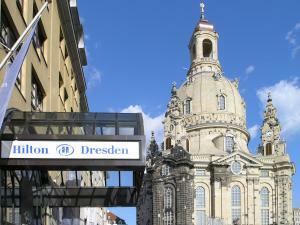 The hotel is 4 km from the Frauenkirche church, and it is a 10-minute drive to Dresden Castle. Albrechtsberg Castle is also just 3.5 km away. Prellerstraße tram stop is just across the road from the hotel. Just a 10-minute walk from the River Elbe, this hotel in the quiet Laubegast district of Dresden offers à-la-carte cuisine, varied cosmetic treatments, and easy tram connections. All rooms at the Ramada Resident Hotel Dresden feature WiFi and cable TV. The modern bathrooms include a shower and hairdryer. A buffet breakfast is available in the Karree restaurant each morning. Several regional and international dishes are served for dinner. Guests can also relax with a drink in the TREFFpunkt bar. Rental bicycles are available for exploring Dresden’s city. A tour desk and ticket service helps guests to plan their stay. 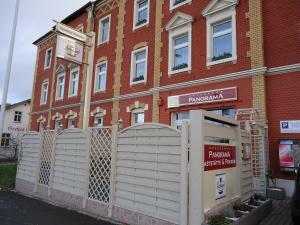 The Ramada Resident is 400 metres from the Alttolkewitz tram stop. Within 20 minutes, trams run to the Semper Opera, Zwinger Palace, and Frauenkirche Church. This Neoclassical-style villa is located beside a forest park in Dresden’s Blasewitz district, 4 km from Dresden’s historic quarter. Villa Freisleben offers free WiFi, elegant interiors and a beautiful garden terrace. 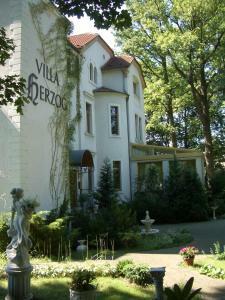 Aparthotel Villa Freisleben dates from 1916 and features an Art Nouveau design. The bright and spacious rooms all feature a large seating area, marble bathroom and a fully equipped kitchenette. The Freisleben’s stylish breakfast room features a chandelier, large bay windows and shiny wooden floors. Guests can also enjoy the rich breakfast buffet outside on the terrace. Lene-Glatzer-Straße tram stop is 100 metres from Aparthotel Freisleben. Direct trams take just 10 minutes to reach Dresden Main Station and the Old Town district with the Semper Opera, Zwinger Palace and Frauenkirche Church. On-site parking is free at Villa Freisleben. Wi-Fi is available in all apartments. This hotel offers free internet access and free private parking. 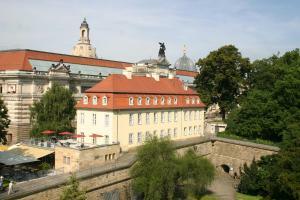 It is located in the centre of Dresden, a 1-minute walk from the main train station. All rooms at the Hotel Kipping include cable TV and a work desk. Both Wi-Fi and internet via cable are available free of charge. Saxon and international meals are served in the hotel's restaurant. The restaurant is open each evening from Monday to Saturday. Buses, trams and trains are just a few steps from the Hotel Kipping. The sights of the Old Town are a 20-minute walk away. The hotel offers rental bikes and is within easy reach of the popular Elberadweg cycle path. 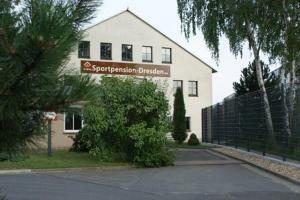 Dresdener Höhe is located just 100 metres away from Dresden Sportpark with its tennis courts, sauna and restaurant. Guests can relax in the garden at the guest house and on the terrace in warmer months. 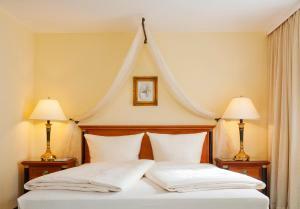 Rooms at Dresdener Höhe are bright and classically decorated. They each feature a minibar and satellite TV, as well as a private bathroom with a shower, free toiletries and towels. Further restaurants serving a range of local and international cuisine can be found within a 15-minute walk of the property. Dresdener Höhe offers grocery deliveries, barbecue facilities and breakfast served to the room. 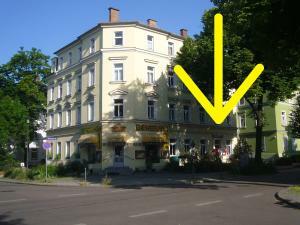 The guest house is 4 km from Frauenkirche church, 4 km from the old market square and 6 km from Messe Dresden Trade and Exhibition Grounds. Klotzsche Airport is 12 km away. Free public parking is possible at Dresdener Höhe, and the A17 motorway is a 5-minute drive away. Dresden Main Train Station can also be reached in 5 minutes by car. Set in the historic Old Town of Dresden, this design hotel is just 3.5 km from Dresden Exhibition Centre. Motel One Dresden am Zwinger is has free Wi-Fi and a 24-hour reception. The modern bedrooms are soundproofed, and offer air conditioning, a desk, and a flat-screen TV. The bathrooms are en-suite and come with a hairdryer, towels, and a rain shower. A hearty breakfast buffet is served every morning in the One Lounge. This is a café, bar and lobby area, where a range of snacks and refreshments are served around the clock. Motel One Dresden am Zwinger is an ideal starting point for walks through Dresden’s baroque city centre. The Saxon State Opera Dresden is 250 metres away, and the River Elbe is a 10-minute walk away. Postplatz tram stop is 100 metres from Motel One Dresden am Zwinger . Dresden Main Station is 1.5 km from the hotel, with connections to Berlin and Dresden Airport. 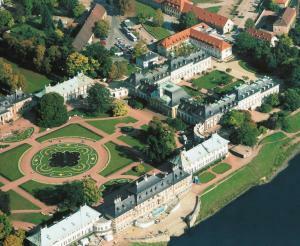 The Baroque Schloß Pillnitz was the former summer residence of the kings of Saxony. The Fliederhofstube, with adjacent terrace, is available for weddings and parties throughout the year. Dresden has much to offer in the way of cultural events, exhibitions and concerts. In addition, each of the rooms and apartments includes a TV and a private bathroom with a hairdryer. A fresh breakfast is available each morning at Hofgärtnerhaus, and the restaurant serves an array of regional and international cuisine. A further selection of bars, restaurants and cafes can be found within just a 5-minute walking distance of the accommodation. The Frauenkirche church is just 300 metres from the hotel, and it is 500 metres to the Altmarkt market place. Dresden Messe exhibition centre is a 5-minute drive away. Dresden Main Station is 1.8 km from Hofgärtnerhaus. The Hotel Ambiente is 9 km from the centre of Dresden. It offers free Wi-Fi internet and a daily breakfast buffet. The quiet rooms of the 3-star Superior Hotel Ambiente are furnished in country style and feature free Wi-Fi internet access. A breakfast buffet is served each morning at the Hotel Ambiente. The Niedersedlitz S-Bahn (city rail) station is a 3-minute walk from the Ambiente, providing fast access to the city centre and to Dresden Airport within 35 minutes. This aparthotel is centrally located in Dresden, a 10-minute walk from the Congress Centre, Zwinger Palace, Semper Opera and Frauenkirche church. All accommodation comes with free WiFi and private kitchen facilities. 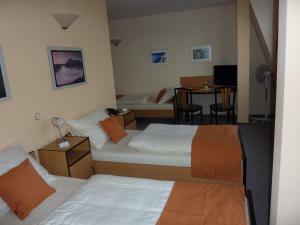 Each room and apartment at Aparthotel Mitte comes complete with cable TV channels and a private bathroom with shower. All interiors are allergy-friendly. Dresden Mitte Train Station is just 200 metres from the aparthotel, and the S2 line goes directly to Dresden Airport, 8 km away. Aparthotel Mitte is also just 700 metres from Postplatz, offering excellent bus and tram connections throughout Dresden. This modern, 4-star hotel offers scenic views of the Elbe River Valley, a large spa with 2 roof terraces, and rich buffet breakfasts. Dresden city centre is 6 km away. 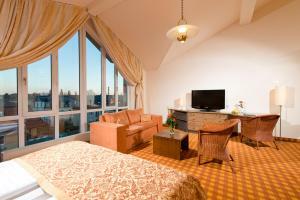 All rooms at the KIM Hotel Dresden are air-conditioned and feature a flat-screen TV, minibar, and safety deposit box. Free WiFi is provided in the business rooms and public areas, and free wired internet is available in all other rooms. The KIM Dresden's elegant spa includes a modern sauna area and large 800 m² gym. Different massages and beauty treatments can be booked at the 24-hour reception. The KIM's country-style KITZO Alpenstüberl restaurant prepares Bavarian and Austrian specialities. In summer, food is served outside in the beer garden. Drivers can make free use of the KIM Hotel's large park deck. Tram number 7 stops directly outside the KIM, providing easy access to the Old Town district. There are 2 restaurants with a terrace, a cosy lobby bar and 8 event rooms for up to 150 people. You can use the sauna, steam room and fitness room free of charge. Massages, a solarium and a bicycle rental service are available for a surcharge. The apartment building is also home to shops, a supermarket, a hairdressing salon, and a launderette. 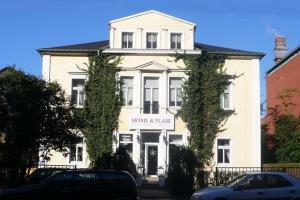 This charming hotel offers attractive accommodation in the Löbtau district of Dresden. Excellent tram connections can bring you to the main sights of the city in just a few minutes. The bright, spacious rooms of the Weltcafé hotel are tastefully decorated in pastel shades and feature free Wi-Fi internet access. Most rooms share a bathroom with another room, while the suites feature a private bathroom. Guests can enjoy a breakfast buffet before setting out to explore fascinating Dresden. The Weltcafé offers fair trade and organic produce, including aromatic coffees, teas, tempting waffles and Lammsbrau beer on tap. Just a 5-minute drive from the Semper Opera House, this 4-star hotel in Dresden offers a top-floor spa, soundproofed rooms, and fine international cuisine. Free Wi-Fi is available in the entire hotel. The NH Dresden Neustadt provides modern, air-conditioned rooms with flat-screen TV, minibar, and desk. All bathrooms include a bathrobe and free toiletries. Late check-out is available free of charge on Sundays until 17:00. The spa area at the NH features a sauna, steam room, and solarium. Guests can keep fit in the gym or rent bicycles at the 24-hour reception. Dresden specialities and international dishes are served in the NH Dresden Neustadt’s restaurant. A children’s menu is available here. In summer, guests can eat outside on the terrace. The Friedensstraße tram stop is only 150 metres from the NH. Trams run to the Old Town district within 20 minutes. Underground parking is available at the hotel. Offering free Wi-Fi, this family-run guest house is situated within a historic building. All the soundproofed rooms have hot drinks facilities, and Dresden-Neustadt Train Station is a 5-minute walk away. The non-smoking Gästehaus Stadt Metz has elegantly furnished rooms, apartments and suites. Flat-screen TVs with cable channels and minibars are provided. Guests are welcome to start the day in the bright breakfast room. Many restaurants, cafés and fashionable boutiques can be found on Königstraße within a 5-minute walk. The Anton-/Leipziger Straße Tram Stop is directly in front of the guest house. Trams run directly to the Zwinger Palace and the Semper Opera House. The Palace Square can also be reached on foot in 15 minutes. 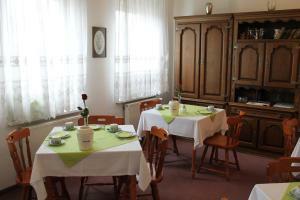 This guest house is located in Dresden, 3 km from the Old Town district. Pension an der Weisseritz offers free WiFi and free parking. All rooms at Pension an der Weisseritz feature satellite TV, a desk and a private bathroom with shower. 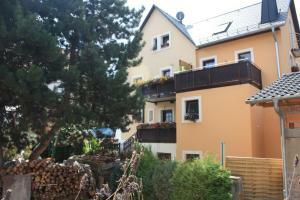 The guest house is located in a quiet side street, directly on the small Weisseritz river. Bike rental and bike storage is available. Guests are also welcome to relax with a massage in the physiotherapy practice, or enjoy a Hungarian speciality in the Budapest restaurant. 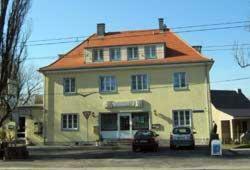 Pension an der Weisseritz is 2 km from Dresden Main Station and 11 km from Dresden Airport. This non-smoking hotel is surrounded by peaceful countryside, a 12-minute drive from Dresden city centre. It offers free parking and free Wi-Fi in public areas. The rooms at the Hotel Heidenschanze have satellite TV and a private bathroom. Each morning, a varied breakfast buffet is served in the Heidenschanze’s breakfast room. Bus connections can be found less than 250 metres from the hotel. From the tram stop, 1 km away, it is a 10-minute ride to Dresden Central Station. 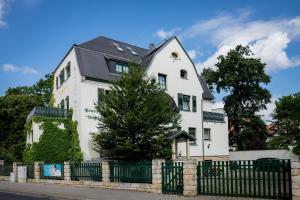 This aparthotel is located in Dresden, just 5 km from the Old Town attractions. Romantik Landhaus features a terrace and children's playground. All apartments at Romantik Landhaus offer a fully equipped kitchen as well as a seating area with a flat-screen TV. The private bathrooms come with a bathtub or shower as well as a hairdryer and free toiletries. Guests are welcome to use facilities in a neighbouring hotel, which offers a wellness area with pool, saunas, and massages. Breakfast can also be booked here. Romantik Landhaus is also an ideal base for hiking and cycling in the surrounding Saxon countryside and in the Elbe Valley. 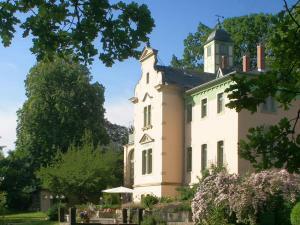 Romantik Landhaus will happily organise trips and book tickets for local attractions. The Spaßbad Elbamare swimming pool is a 5-minute walk away. The property is 4.7 km from the Messe Dresden exhibition grounds, 6.5 km from the Rose Garden and 12 km from Dresden Airport. Located on Prager Strasse Shopping Street, this 4-star design hotel is a 3-minute walk from Dresden Main Station. Elegant rooms, a modern spa area and panoramic city views are offered. The air-conditioned rooms of the Pullman Dresden Newa feature a glass spa shower and panoramic windows. They also have satellite TV and a minibar. The Ginkgo spa in Dresden’s Pullman hotel includes a sauna and steam room. Massages and beauty treatments are also available. A personal trainer can be arranged on request. A range of Mediterranean and regional dishes are served in the Le Boulevard - Easy Dining restaurant with terrace. Guests are welcome to relax in Schwenke's Cocktail & Coffee Lounge. Dresden’s historic Old Town and Frauenkirche Church are just a 5-minute walk away. The tram stop opposite the hotel provides connections to all parts of the city. Situated directly on the River Elbe in central Dresden, this peaceful hotel is a 5-minute walk from the Neustadt Train Station. It offers free Wi-Fi and free parking. The double rooms and apartments at City-Oase are decorated on themes that are inspired by Dresden's cultural attractions. The Frauenkirche church, Semper Opera House and Brühl Terrace are within a 10-minute walk from here. Breakfast is available each morning, and is served to your table. Rooms are cleaned daily, and towels are replaced every 3 days. City-Oase is a non-smoking hotel, but guests are welcome to enjoy a cigarette in the garden. This hotel is located in the city centre, just a few steps away from the Semper Opera House and Dresden's historic Old Town district. 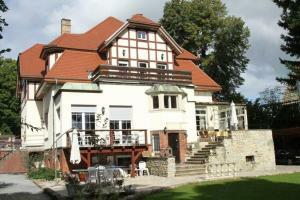 It offers spacious accommodation, a swimming pool and a large terrace along the River Elbe. The elegant, air-conditioned rooms at the Maritim Hotel Dresden feature a minibar, a TV with 2 SKY sports news channels (1 in English, 1 in German) and a safe with laptop charger. WiFi is provided free of charge for guests in the whole hotel. Hotel guests can also use the Maritim Hotel Dresden's modern spa area for free. This has a swimming pool, sauna and steam room. A beauty salon and massage services are also available at a surcharge. From the conservatory restaurant with terrace, offering international and regional dishes, you have views of the Elbe and city centre. The Sky sports bar has live music every day. The hotel is a 10-minute walk from Dresden's numerous sightseeing attractions. The pathway along the Elbe is also popular with hikers and cyclists. The hotel is happy to provide tips to help you get the most out of your trip to Dresden. The reception staff can also make reservations for restaurants, tourist attractions, sightseeing tours, events or the Weiße Flotte steamships. This peacefully situated, 3-star hotel in Dresden occupies a historic villa dating back to the turn of the 20th century. Enjoy the free breakfast buffet before exploring beautiful Dresden. 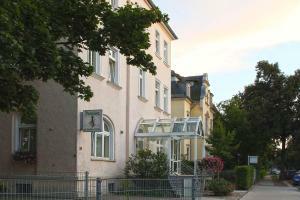 The Pension am Großen Garten lies just 500 metres from the popular Volkspark Großer Garten park. Here, you can have a quiet night's sleep in your modern, cosy room which has free Wi-Fi. Leave your car in one of the Pension am Großen Garten's free private parking spaces. Just a 3-minute walk away, you will find a tram stop from which it takes only 10 minutes to reach Dresden's city centre. The guesthouse complex spans two neighbouring roads - Ostra-Allee and Maxstraße - which are home to some of the city's last remaining Wilhelminian period buildings. Set in a large boat on the Elbe River, Beherbergungsschiff D.Pöppelman offers unique accommodation with a bar and terrace. It is docked a 15-minute walk along the river from Dresden's Old Town. Beherbergungsschiff D.Pöppelmann provides colourfully decorated dorm-style beds and cabins, all featuring a shared bathroom. Breakfast is available on the boat. WiFi is provided free of charge in the lobby area and the breakfast room. Popular activities in the area include hiking and cycling, and in summer bike rentals are available. Purobeach Club with a swimming pool, beach volleyball and a cocktail bar is just 50 metres from the boat. Dresden Neustadt Train Station lies 1.5 km away, and the A4 motorway is a 10-minute drive. Free parking is provided on site. Free Wi-Fi is offered at this hotel, situated a 1-minute walk from Bischofsweg tram stop. Pension Olé offers simply decorated rooms and fully equipped apartments in the trendy Neustadt district. Rooms at Pension Olé are bright and feature satellite TV and a desk. The apartments come with a private bathroom. Apartments are self-catering and come with a kitchen or kitchenette. The Neustadt district is home to many cafes, bars, and restaurants all located within a 10-minute walk from the hotel. Pension Olé is a 15-minute walk from Dresden-Neustadt Underground Station, offering direct connections to Dresden Main Station. Dresden’s historic Altstadt (Old Town) district is 11 minutes’ away by tram. 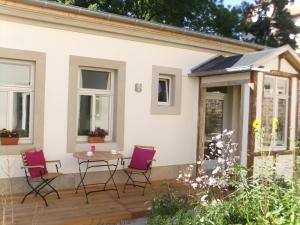 This charming guest house is centrally located in Dresden and offers guests free WiFi in common areas. Rooms at Villa Sommerschuh are decorated in muted tones and have hardwood floors and a seating area. The property has a garden with comfortable lounge areas. Some rooms have a garden view, and some rooms have a private bathroom with shower and WC. There are restaurants in the area featuring local cuisine as well as a Lebanese restaurant which is a 5-minute walk from Villa Sommerschuh. Breakfast can be enjoyed at the property for an extra cost. Villa Sommerschuh is conveniently located only 600 metres from Dresden Main Station, and 2.3 km from the famous Zwinger palace, the Frauenkirche church and the Grünes Gewölbe historic museum. Dresden Airport is 13 km away. The comfortably decorated Alttolkewitzer Ferien- & Privatzimmer Mrosk Dresden is a 3-minute walk from the River Elbe. All rooms have a kitchenette with a refrigerator. The hotel offers non-smoking rooms and an apartment. Each features a comfortable seating area and cable TV. All double rooms include a terrace. Several restaurants are within a 10-minute walk. A supermarket can be found 100 metres from the hotel. Alttolkewitzer Ferien- & Privatzimmer Mrosk is directly beside the Elbe Cycle Trail, and is an ideal base for hiking, cycling or boat trips. Alttolkewitz tram stop is 100 metres from the property and Dresden city centre is 15 minutes away by tram. 1 car can park for free. 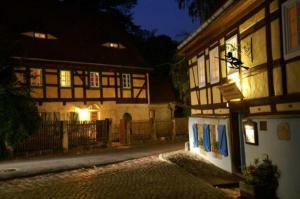 This 4-star superior hotel is located in one of Dresdens most beautiful quarters, Blasewitz. The historic city centre is just a short public transport ride away using nearby connections. Comprehensively renovated in spring 2009, the Hotel Am Blauen Wunder - Privathotel offers rooms which feature a Venetian décor and elegant marble bathrooms. Wi-Fi is available for an additional fee. At the centre of the Am Blauen Wunder hotel, you find the hotel bar, which invites you to enjoy speciality coffees, a wide selection of spirits, as well as small snacks. Cyclists will enjoy the Elberadweg cycle path along the river Elbe. On the Elberadweg website you can find cycle routes and tips on where to find the most interesting and significant sights along the Elbe. The tram stop is just a 3-minute walk away. From the Am Blauen Wunder, it takes just 20 minutes to get into Dresdens Old Town. Furnished with antiques and featuring a rose-filled, romantic courtyard this bed and breakfast is located just 8 km from central Dresden. Pillnitz Palace is just 2 km from the property and Hp. Dobritz Train Station is 4 km away. Guests can enjoy floral décor in each room, which features a flat-screen TV and free WiFi. The private bathrooms come with a hairdryer. A delicious continental breakfast is served each morning. One room has a kitchen which features a fridge, and guests will find plenty or restaurants and cafes within 20 minutes’ of the property. Visit the famous Dresden Old Town just 8 km from Pension zur Königlichen Ausspanne Dresden, or take a day trip to Saxon Switzerland which is 31 km away. There are plenty of opportunities for cycling and hiking in the surrounding area. Free parking is available at the property. Central Station Dresden is 8 km from the property and Dresden Airport is 14 km. 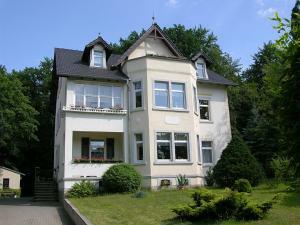 Private Gästezimmer im Mehrfamilien-Jugendstilhaus is a homestay centrally located in Dresden. Free WiFi access is offered. Rooms are colour-themed and have a seating area and a desk. A hairdryer and free toiletries are provided in the shared bathrooms and there is also a washing machine. Guests can prepare meals in the shared kitchen or experience local cuisine in one of the many restaurants in Dresden. The city center is only a 10 minute drive away or 2 stops with the street car. There, guests can visit sites such as the Gruenes Gewoelbe historic museum and the Frauenkirche. Guests looking for relaxation can go next door for an Ayurvedic massage or to use the sauna. The property offers free parking. It is located 2 km from the Main Station and 16 km from Dresden Airport. Boasting a charming architectural design and well-kept garden, this non-smoking guest house is a relaxing port of call near Dresden’s heathland. Free WiFi access is available. Unwind in the tranquil atmosphere and take in the picturesque Elbe riverbed at your doorstep. Dresden’s historic city centre with its renowned Frauenkirche church and Semperoper opera house is just a 15-minute walk or bicycle ride away. Stroll to the nearby restaurants and bars after a busy day of sightseeing. The popular Waldschlösschen district with its stimulating entertainment facilities will keep you smiling in the evening. 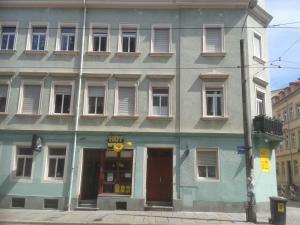 Located in the Cotta district of Dresden, this guest house offers accommodation as well as a hearty breakfast buffet in the morning. The Semper Opera House, the Zwinger Palace and Dresden Central Station are all a 15-minute ride away using public transport. 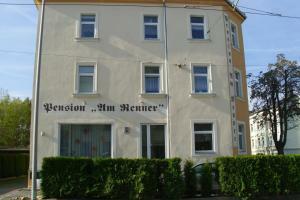 Hotel Pension Am Renner offers non-smoking rooms with en suite bathrooms and satellite TV. 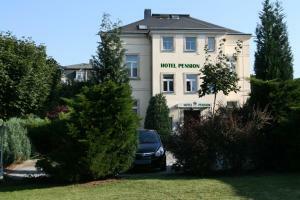 The Pension Am Renner is just 50 metres from Pennricher Straße tram stop. Tram lines 2 and 12 run directly to Dresden city centre in around 12 minutes.The Messe Exhibition Centre and Congress Centre are also about 15 minutes away by public transport. The A4 and A17 motorways are 3 km away and free parking is available at the guest house. Dresden Airport is 12 km from the property. This 3-star-superior hotel offers free Wi-Fi, free parking, and a 24-hour bar. 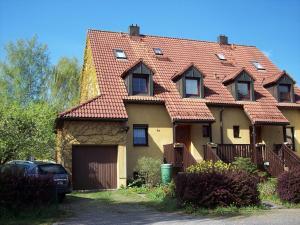 It is 3 minutes from the A4 motorway and 10 minutes from central Dresden and Dresden Airport. All rooms at the family-run Hotel Novalis Dresden include a minibar, satellite TV, and a hairdryer. All guests get a free glass of prosecco upon arrival. A large breakfast buffet is available here. The Hotel Novalis Dresden’s bistro restaurant serves traditional Saxon food and international dishes every evening. Guests can also relax in the beer garden. Leisure facilities at the Hotel Novalis include a Finnish sauna. This can be used on request. 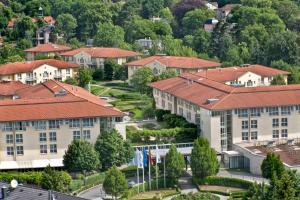 Hotel Novalis Dresden is a great base for hiking trips in the Sächsische Schweiz countryside. This features unique sandstone formations. The Old Town district of Dresden is also just 15 minutes away by public transport. This inviting hotel is just a 10-minute walk from the city centre and Dresden's historic Old Town. It offers Italian-style accommodation and a sauna and fitness area with a terrace, offering panoramic views of the city. Rooms at the Hotel Elbflorenz Dresden include French windows. Each is equipped with cable TV, air conditioning, and a minibar. La Piazza Bistro offers homemade cakes and pastries, and the Ristorante Quattro Cani serves Italian dishes. Drinks can be enjoyed in the La Piazza Bar and Bandinelli lounge, or outside on the summer terrace. Sights including the Frauenkirche Cathedral and Semper Opera House are 10 minutes on foot from Hotel Elbflorenz Dresden. The hotel is also directly connected to Dresden's Messe Trade Center, just 3 km away. The Hotel Elbflorenz is located opposite Freiberger Straße Train Station. From here, guests can reach all parts of the city. Underground parking is available on site. This modern hotel is ideally situated in Dresden’s city centre, right between the Dresden Main Station and the historic Old Town district. All rooms at the Ibis Hotel Dresden Lilienstein include a TV, desk and a private bathroom. Wi-Fi is available in the entire hotel for an extra fee. Breakfast is served between 04:00 and 12:00 each morning. Reception and the bar are open 24/7, and drinks and snacks are available at all times. The Ibis Dresden Lilienstein is 5 km from the Dresden Exhibition Centre and 10 km from Dresden Airport. This family guest house is a historic villa in the Loschwitz district of Dresden, 700 metres from the Blue Wonder Bridge. Dresden city centre is a 12-minute drive away, and Wi-Fi is free for guests. The elegant rooms at Gästehaus Loschwitz feature cable TV, a work desk and a bathroom with shower and hairdryer. Guests at Gästehaus Loschwitz can go hiking or cycling in the nearby Dresdner Heide (Dresden Heath) Nature Reserve. This modern 3-star-superior hotel lies in the Neustadt district of Dresden, a 5-minute walk from the banks of the River Elbe. It offers spacious rooms and a 24-hour lobby bar. All rooms at the Park Inn by Radisson Dresden have air conditioning, cable TV, free standard WiFi and a private bathroom. High-speed WiFi is available at an additional cost. A breakfast buffet is available each morning (from 06:30 till 11:00 on weekdays and from 06:00 till 10:30 at weekends) at the Park Inn by Radisson Dresden. The Zum Atrium restaurant serves regional and international dishes. Dining is possible on the terrace in summer months. The Park Inn by Radisson Dresden is steps from Rosa-Luxemburg-Platz tram stop. This is just 3 tram stops from Dresden Neustadt Train Station. This completely renovated hotel features a new modern-baroque design. The centre of Dresden, featuring sights such as the Frauenkirche Church, is a 10-minute walk away. 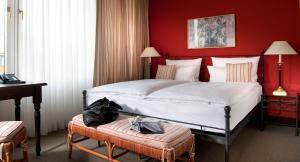 The rooms of Gewandhaus Hotel Dresden have a modern-baroque design and there is adjustable air conditioning in all rooms. The bathrooms are decorated in Italian marble and many have a spa bath. The [m]eatery restaurant + bar specialises in willow beef. The Kuchen Atelier also serves a variety of tea/coffee specialities and homemade cakes. Guests can walk to the centre or take the tram. The Pirnaischer Platz tram stop is a 2-minute walk from the Gewandhaus Hotel Dresden. Tram number 4 runs to the Semperoper Opera House in just 5 minutes. This 3-star hotel in the quiet Kauscha district of Dresden offers a modern sauna area, traditional Saxon food, and great links with the A17 motorway. Free Wi-Fi is available in all parts of the Landhotel Dresden.The bright, non-smoking rooms were all renovated in 2010. Guests are welcome to use the Landhotel’s Finnish sauna, waterfall showers, and bucket showers. There is also a sunbathing area and a children's playground. A rich breakfast buffet with gluten-free and lactose-free options is provided at the Landhotel Dresden every day. The hotel’s Bellevue restaurant with terrace is open in the evenings, and also serves many gluten-free dishes. Dresden city centre is a 15-minute drive away from the Landhotel, and there is a park & ride facility just 1 km away. Famous attractions include the historic Frauenkirche church, the Semperoper (opera) and the Zwinger palace. Dating from 1888, this 4-star boutique hotel lies in Strehlen, Dresden’s villa district. It offers elegant rooms, a gym and a sauna. The Grosser Garten park is 600 metres away. An international breakfast is served daily. The Red Grill restaurant serves a variety of fine American cuisine and German classics as well as select wines. Drinks are served in the 24-hour Davidoff Lounge. Dresden-Strehlen Train Station is just 500 metres from Dresden’s Dormero Hotel Königshof. Tram and buses stop right outside. Dresden city centre is an 8-minute tram ride away. All rooms at the Dormero Hotel Königshof Dresden come with free WiFi, free Sky-TV and a complimentary minibar. This hotel has the largest ballroom in Dresden, which is famous for its baroque interior. Offering charming garden views, Holiday Home Charlotte is located in Dresden. There is free WiFi access in all areas and free private parking is available on site. As well as a living area with a flat-screen TV with satellite channels and a sofa, guests will find a private bathroom in the holiday home. It comes complete with a shower, a hairdryer and free toiletries. Upon request, a continental breakfast can be served each morning at Holiday Home Charlotte. There is an electric kettle for guests wanting to make a cup of tea or coffee. 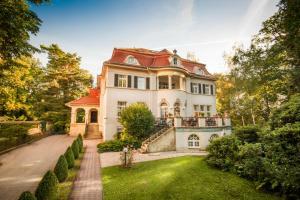 The property offers private sightseeing tours in English or German of Dresden and of the Saxon Switzerland countryside for guests wanting to explore the area. Dresden Central Train Station is 10 km away and can be reached in 50 minutes using public transport. Dresden Airport is a 30-minute drive from the property. This hotel stands beside the Dresdner Heide Nature Park, a 5-minute drive from Dresden Airport and the A4 motorway. It offers free Wi-Fi, free parking and regional food. 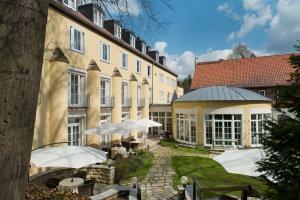 The 4-star Hotel Dresdner Heide provides soundproofed rooms and suites. Every room includes free Sky-TV and a complimentary minibar. The Take Off bar also offers snacks and drinks. Dresdner Heide’s spa features a Finnish sauna, a herbal sauna and a steam bath. Guests can relax on the courtyard terrace in warm weather. Trams are just a 3-minute walk from the Hotel Dresdner Heide. They travel directly to Dresden’s Old Town, where attractions include the Semper Opera. This 4-star hotel is situated in the Plauen district of Dresden. It is next to the TUDIAS Technische Universität Dresden university and offers excellent bus links into town. Holiday Inn Dresden City- South has spacious rooms with tea and coffee facilities. Wi-Fi is available free of charge in the entire hotel and some rooms provide USB wall plugs. Regional dishes are served for dinner in the Holiday Inn Dresden City- South's restaurant. The in-house Starbucks café offers all-day coffee. The hotel enjoys good bus connections to the city centre. From the nearby bus stop, the city's Altmarkt marketplace can be reached in 8 minutes. All of Dresden’s other main attractions can be reached within 10 minutes by bus. The brightly decorated rooms and apartments at the ACHAT Comfort Dresden Altstadt feature 23 free satellite TV channels, a desk, and free mineral water. Wi-Fi is free in public areas. Full buffet breakfasts are available at the ACHAT Dresden Altstadt in the mornings, and the Feldschlösschen restaurant serves regional Saxon specialities. Guests can enjoy a range of drinks and watch satellite sports channels in the ACHAT’s lobby bar. The Budapester Straße bus stop is directly opposite the ACHAT Dresden. Buses run to the Baroque Old Town district in just 5 minutes. Bicycles can also be hired at reception. Situated in Dresden’s peaceful Trachau district, this 4-star hotel features a daily buffet breakfast and 2 terraces with panoramic city views. A 24-hour front desk and free parking are provided. The contemporary-style restaurant serves a selection of Saxon specialities, and drinks can be enjoyed at the stylish Cubar bar. Bergwirtschaft Wilder Mann also has an on-site confectionery and butcher’s shop. A modern private bathroom and cable TV are provided in each of the classic rooms at Bergwirtschaft Wilder Mann Hotel und Restaurant. Dresden-Trachau S-Bahn Train Station is only 350 metres from the property, taking you to the centre of Dresden in 15 minutes. This hotel is perfectly located on the Altmarkt square, in the heart of Dresden. The Star Inn Hotel Premium Dresden offers free WiFi and is a 5-minute walk from Zwinger Palace, Semper Opera and Frauenkirche. Opening in February 2015, Star Inn Hotel Premium Dresden im Haus Altmarkt offers rooms and suites with modern design and high-quality beds. All rooms include includes a 42-inch flat-screen TV, a telephone, mini-fridge, safe, desk, free WiFi and a bathroom with shower and hairdryer. A rich breakfast buffet is offered each morning. Many great bars, restaurants and cafés are located within a 2-minute walk. The Prager Straße shopping street is also just 350 metres away. The Wiener KaffeeHaus Altmarkt is located in the hotel. This provides the ambience of a Viennese-style coffee house. The Star Inn Hotel Premium Dresden im Haus Altmarkt also offers a 24-hour reception and luggage storage. There are great tram connections to all parts of Dresden, and Dresden Main Station is a 15-minute walk away. Dresden Airport is 9 km away. These modern suites and apartments lie in the historical centre of Dresden, either beside the Frauenkirche church or the Old Marketplace. They feature free Wi-Fi and a kitchen with washing machine. 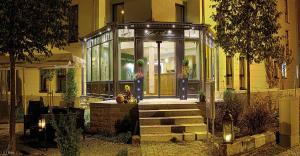 Aparthotels An der Frauenkirche provides spacious accommodation with all modern comforts. A flat-screen TV, stereo system and a hairdryer are included. A rich breakfast buffet is available each morning at the Gasthaus am Neumarkt. This is located directly beside the Frauenkirche church, 120 metres away. Traditional Saxon cuisine is served here in the evenings. Guests can use the Aparthotels’ rental bicycles to discover Dresden and the River Elbe. The hotel also offers an airport shuttle service. Located near the River Elbe, the stylish Pension Villa Angelika offers you excellent public transport links, free parking and a central base for exploring Dresden. 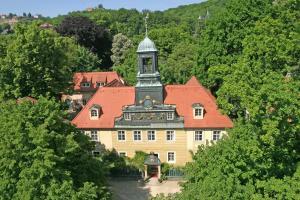 It is set just 200 metres from the three Elbe Palaces and the popular Waldschlösschen Brewery. 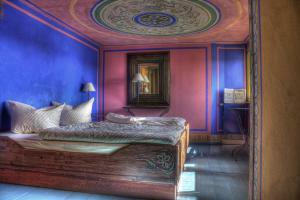 All rooms and apartments at Pension Villa Angelika feature free WiFi as well as box-spring beds. Some rooms offer a balcony. A breakfast buffet is available in the breakfast room, where guests can also enjoy drinks throughout the day. Guests can also relax in the hotel's study, and WiFi access is available for an additional charge. Use the local tram services to visit the beautiful Old Town, where you find the Zwinger Palace and the Frauenkirche (church). Guests can also make use of the hotel’s rental bicycles to explore the city’s charming squares and the beautiful countryside. This design hotel in the heart of Dresden offers free Wi-Fi in all areas and a sauna with panoramic views. It is a 5-minute walk from the International Congress Centre. The 4-star art'otel dresden by park plaza provides air-conditioned rooms with satellite TV and minibar. A hairdryer is provided in each bathroom. The Mix café serves gourmet sandwiches, bagels and coffees. The Factory restaurant offers modern cuisine for lunch or dinner. The art'otel dresden features a permanent display of the works of A. R. Penck, a famous German artist. The hotel organises a free guided tour for guests every day. The Zwinger Palace and the Semper Opera are within a 10-minute walk of the art’otel dresden. The Kongresszentrum tram stop is a 3-minute walk away. 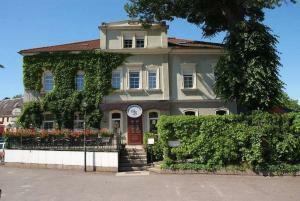 Surrounded by vineyards and charming gardens, this chic hotel is peacefully located in Dresden’s Radebeul district. An elegant restaurant and spacious accommodation with free Wi-Fi are offered here. Set in a carefully restored, 18th-century villa, the bright rooms and suites at Hotel Villa Sorgenfrei feature hand-painted walls, wooden floors and antique-style furniture. Comforts include a flat-screen TV and delightful garden views. An à la carte or continental breakfast is available each morning. French dishes and Mediterranean-inspired cuisine is served in Sorgenfrei’s restaurant (which is closed on Mondays and Tuesdays). The hotel is ideally located for guests wishing to explore the Saxon Wine Route. After an eventful day, visitors can relax with a glass of fine wine on the terrace. Free private parking is available at Hotel Villa Sorgenfrei. The historic city of Dresden is 9 km away. Located opposite the Japanese Palace in the Neustadt district of Dresden, this non-smoking, design hotel offers air-conditioned rooms, a 24-hour bar, underground parking and free Wi-Fi. 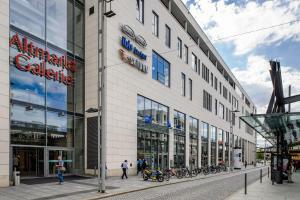 The 2-star Motel One Dresden – Palaisplatz has stylish rooms with a flat-screen TV. The bathrooms feature a rain shower and elegant mosaics. Varied breakfast buffets and a range of drinks can be enjoyed at the 24-hour One Lounge at the Palaisplatz Motel One. The Palaisplatz tram stop is outside the Motel One Palaisplatz Dresden. Trams run to the famous Semper Opera House and Zwinger Palace in only 5 minutes.